Gas leak detectors are designed to find leaks in natural gas lines also known as methane gas. Natural gas is commonly used as fuel in homes and businesses for heating and cooking. Primarily composed of methane this gas also happens to be flammable and can cause explosions when confined indefinitely. This is exactly why a natural gas leak is classified as being very dangerous but finding a leak can be easier said than done. The local gas company employs a number of different types of gas leak detectors to help find and patch up gas leaks before they become worse. However, finding gas leaks on resident land or private property is not easy unless the owner reports it to the gas company. Ultrasonic gas leak detectors – This works by using ultrasonic waves to find leaks. Audio leak detectors – The gas company’s engineers will regularly listen for gas leaks using powerful microphones and headsets. 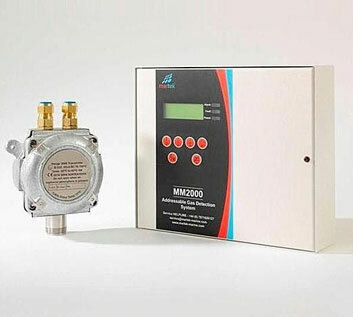 Conventional gas leak detectors – These are usually installed by the gas company and work by monitoring the pressure of gas running though a pipeline, if this pressure falls they know there is a leak. What to consider when purchasing natural gas leak detectors? When you install a natural gas leak detector it should have some way of pinpointing the source of the leak. Gas detectors tend to be very similar to smoke detectors and so they need to be installed in a place where people can hear an audible warning, plus the proximity of the detector to the source of the leak should help to find the leak. If you are installing the leak detector yourself make sure that you follow the instructions given in the user manual of the detector. If your home has multiple natural gas sources you may want to consider installing more than one detector or probably dual sensor detectors. Many household gas leak detectors are battery operated or have a battery that backs them up in the event of a power failure. There may also be a test button on the detector which helps you to check if the alarm and its batteries are working as they should. Always check the batteries and press the ‘test’ button once a week in order to ensure it is working.